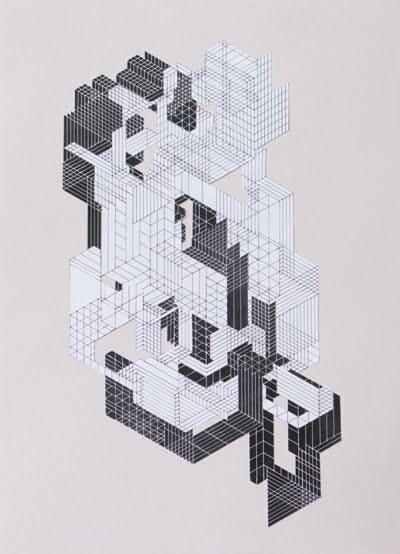 Rento van Drunen’s Gridcollages on pytr75’s blog put my mind back to Albert Pope’s book, Ladders which was published in 1996. This book was very influential on my work and my thinking about urban structures and the systems that are used to put and keep them in place. In Ladders, Pope suggested that the pre war urban grid, when it was first conceived, was an open system. But the post war period saw the grid eroded and slowly replaced with centripetal design strategies. A suburban cul-de-sac or office park, are classic examples of a centripetal system – individuals have little choice but follow a curved paths instead of a straight line. The prewar city was conceived on a centrifugal grid, a road system in which the basic premise was an open spatial field that was boundless and unlimited in form because of its formal simplicity. Pope argues that the postwar city conceived on a centripetal grid is limited in form, creating enclosed spaces that are fragmented and unconnected. Most suburban developments rely on the centripetal grid for organization. When the suburbs were first conceived as “Garden Cities” of the future their aim was to open up space. Therefore, the grid was abandoned to create open access for living and traveling. However, the street planning was not rational like the grid because the communities essentially turned in on themselves and navigation through them could be confusing because one pattern was entirely different from another. 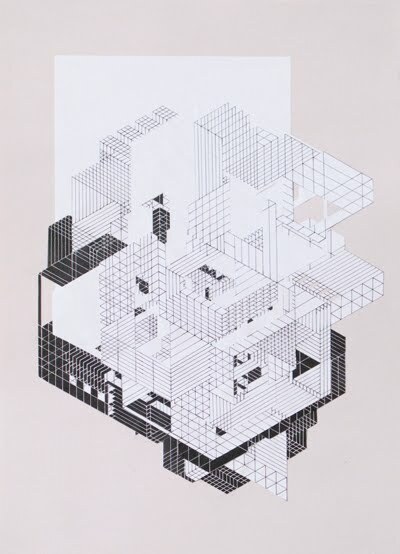 What I find interesting with Rento van Drunen’s Gridcollages is how systematic the grid has become. You can envision ongoing renditions or versions of these modular forms. This fluidity allows for both the creation of new forms and the mutation of existing forms. Gridcollages are not a static configuration but instead can be built upon, like the open street system of a centrifugal grid. I also find it interesting how many artists choose to use the grid as subject matter instead of organic curves of the suburban landscape even though the periphery of the suburban is no longer subordinate to the city. 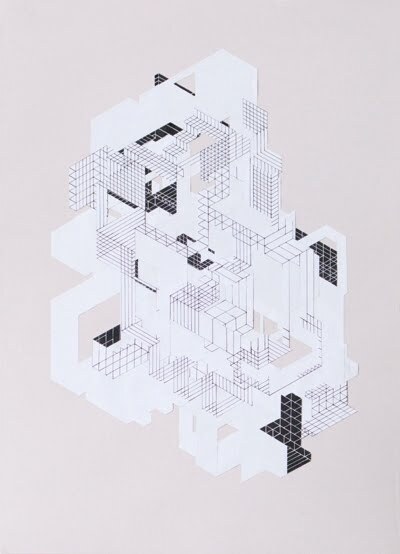 I think it is the formal organisation of the grid, the ongoing possibilities of its open system areas can be added to, dismantled, consolidated, destructed and reconstituted into an endless reconfigurations of forms, structures and plans.